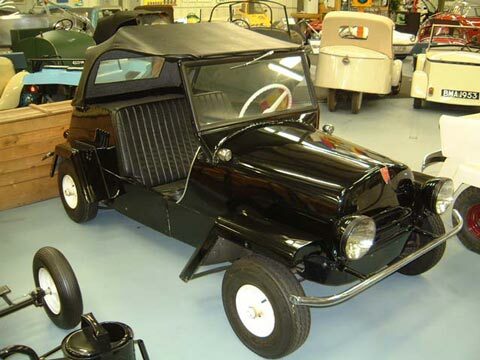 After WWII pilots Claud Dry and Dale Orcutts first car was a crude, midget-racer-styled car built on a wood frame. The Series I was sold in kit form through small ads in Popular Mechanics and other hobbyist magazines of the time for prices ranging from $50 to $300.. In 1951, a much more practical car was offered. Called the Series II, it resembled the Jeep with its square-cornered fenders. Intended for shopping or the golf course, the car gained a considerable following and was produced for five years. It is still popular in Shriners parades. The dimensions of the car were chosen to be that of a 4 x 8 sheet of plywood, in order that four could sit side by side on a railway car: the intent being that a car could be shipped efficiently directly by the customer, who took the key tied to the battery cable, put in some gas and drove away. Parts were scrounged from various Ohio parts suppliers, such as the small car firm of Crosley in Cincinnati, who supplied the steering wheel and muffler. The convertible top bows did not fold down, but could be completely removed as a unit and left at home. Drive was by chain to one wheel, and the mechanical brakes only operated on the rear wheels. Accessories included a wiper, metal doors incorporating side windows, or wooden doors used with canvas side-window inserts. These same doors carried on without change into the early Series III King Midget, introduced in 1957. Weight: 600 lb Electrics: 6 v 4 Wheels: 4.80 x 8"